There can be nothing more iconic at Christmas than the pudding. One might argue that the turkey should have that festive accolade, but let us consider the history of Christmas dinner. Queen Victoria celebrated Christmas with enthusiasm, and her husband Prince Albert introduced German Christmas trees. Charles Dickens was also instrumental in creating the vision of family gatherings, snow, log fire, and yule-tide. The turkey came from the New World, and first found a place on Christmas dinner tables in England in the 16th century, although goose was once our more usual Christmas bird. However, the Christmas pudding is thought to have evolved from very much earlier times. It started life as a pottage, a sort of soup with dried fruit, spices and wine. It was thickened with breadcrumbs or ground almonds. Strangely, it often included meat or at least meat stock. This was also the historic base for mince pies. Yes, mincemeat did originally contain meat. In the 17th century the pottage became a bit more like a sausage. During the 18th century that rich fruity confection became associated strongly with Christmas. Figgy’s Christmas Puddings have that timeless quality of puds of old. The pudding basin is just the same as your Nan would have used. The cloth cover is just perfect and would be recognised by Dickens’ A Christmas Carol’s Mrs Cratchit. One’s expectations will be raised even before the pudding is ready to eat. Richie and Jo Evans, the husband and wife who founded this company, are based in Devon. They always made their own Christmas Puddings for friends and family. These edible gifts were so well-appreciated that the hobby became a delicious business. 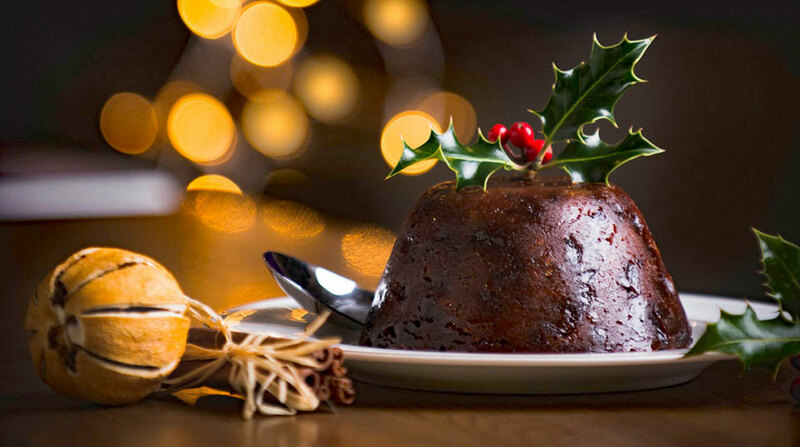 They have been making and selling Christmas Puddings for a decade, with customers all over the UK and Europe. Figgy’s Christmas Puddings are all made by hand in the good old-fashioned way, in the company bakery near Exeter. Time is spent finding the best ingredients and many of these are from local producers and suppliers. Stout and brandy are both sourced nearby, too. There are many Christmas puds out there, but all puds are not created equal. As with much in life, one gets what one pays for. This is perhaps the most important dessert of the year, so finding the best will provide a memorable finale to Christmas dinner. Steam the pudding according to instructions and enjoy its fruity aroma as it is first removed from the basin and then presented at the table. Holly and perhaps dimmed lights and a few flames add theatre to the dinner table.